Give regular cheesecake a delightful twist by adding lime, a distinctive Malaysian flavour. Place digestive biscuits in a plastic food bag and crush to crumbs using roller. Put the biscuit crumbs into bowl, then pour melted Planta Chef Margarine. Mix until thoroughly coated. Tip into serving glass and press firmly down into the base. Chill in the fridge to set it firmly. Bring water to a boil, pour over Carte D'Or Mango Pudding. Stir well to dilute. Transfer into container and keep it in ambient temperature until it sets. Chill. Using mixer, whisk cream cheese, sugar, Knorr Lime Seasoning Powder. Tip in 200ml double cream and continue to whisk until the mixture is completely combined. Transfer into bowl. 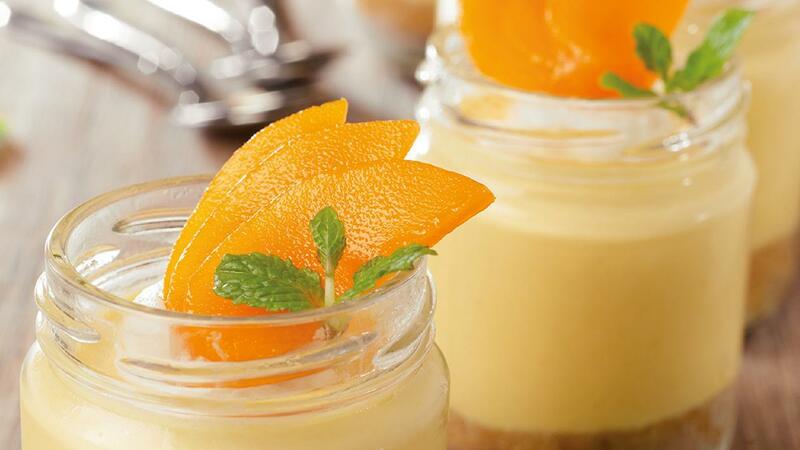 In a bowl, combine Mango Mix and Cream Cheese Mousse until completely smooth. Spoon the mousse mixture into the biscuits base, working of the edge inwards. Keep it set in chiller for overnight. Served with whipped cream on top and slice of fresh mango and mint leaf.